North Carolina sued Insys Therapeutics a pharmaceutical company accusing it of carrying out an illegal opioid scheme. The state says Insys bribed doctors to make prescriptions for Subsys its cancer medicine and tricked insurers into covering the drug. The U.S. is in an opioid crisis of epidemic proportion and Insys allegedly pushed its cancer drug in an unlawful way. Subsys is a very powerful medicine for pain with fentanyl, approved for only patients with cancer who have very bad pain. Josh Stein the Attorney General of North Carolina filed the suit on Thursday accusing the drug maker of bribing doctors to both promote as well as prescribe Subsys. The lawsuit is one more legal woe for Insys. A federal investigation already has charged many former executives with Insys for participating in a scheme to push Subsys unlawfully through bribing doctors. This scheme using bribery in exchange for opioids is said to have been across the country. North Carolina’s AG argues Insys gave doctors money so they would prescribe Subsys even in cases that did not include alleviating pain from cancer. Stein also said that Insys also tricked insurers so the prescriptions for Subsys would be covered. Subsys comes in the form of mouth spray with fentanyl and is extremely strong, which is the reason that only those with great pain caused by cancer are approved to receive it. 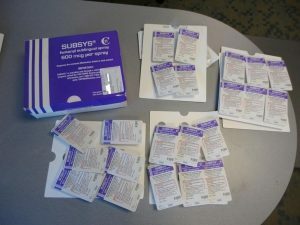 Subsys is said to be 100 times the strength of morphine an over 50 times stronger than heroin, alleges the lawsuit. The North Carolina suit is seeking civil penalties from Insys, and wants to force makers of drugs to give up the profits they make through the opioid scheme. Stein says that the scheme carried out by Insys is unacceptable as well as unconscionable especially when the nation is going through a full blown opioid crisis. According to health officials, the crisis involving opioids within the U.S. has reached an alarming rate and life expectancy has already dropped. Officials have revealed that close to four people each day die from accidental overdoses in the state of North Carolina, and that phenomenon is growing. Of recent, thousands of people who have died in the U.S. have been linked to overdoses of opioids. A report by the CDC revealed that overdoses saw a big spike during 2016 topping more than 63,600 and over 42,00o were due to opioids.